Hannah, how do you start to cook healthy for kids who are used to home-cooked fast food (pasta, burgers, shnitzel/potatoes)? Tanya, I can sympathize. My kids used to eat a lot of those things. They still prefer them over healthier food. But they also eat the healthy food. Here are some ideas for making gradual changes. Pick the least healthy food that you serve. If it’s processed and expensive, even better. Then stop buying it. You can’t control what your kids eat, but you can control what food is available. After a while, you can eliminate something else. Don’t get emotionally involved with your kids’ food choices. If they object to something you make, don’t view it as ungratefulness or a reflection on your worth. That attitude usually backfires. Cook the same foods but in a healthier way. Bake shnitzel or cook meatballs instead of frying hamburgers. Add whole wheat bread crumbs and carrots to ground meat, to stretch it. Replace half of white rice with brown. Start with a healthy, filling soup. That way you can get vegetables and beans into them when they are hungry, and they won’t eat as much of the less healthy main course. Experiment with different textures and ingredients. Have (only) one option for picky kids. “If you don’t want what the family is eating, you can have a peanut butter sandwich.” Don’t get into the habit of cooking separate meals. Gradually reduce amounts of unhealthy ingredients. Reduce the sugar, oil and salt and buy lower-fat cheese. Be patient and stay the course. There will probably be grumbling, but much of it will pass. Save less healthy favorites as a special treat. This can be weekends, once a month or birthdays—whatever you decide. Start young. This is especially important if you are planning on more kids. Get your kids involved with menu-planning, shopping and cooking. Stay in control, but let them make some decisions too. Start with small quantities of a new food. Better to run out because everyone likes it so much, than having to throw it out because you made too much. Assume everyone will like it. If kids sense that you are apprehensive about a new food, they are more likely to refuse it. What healthy changes have you made to your family’s menu? How did your kids react? My mom was in favor of having other people feed us…that is that we were willing to eat new things at other people’s homes. 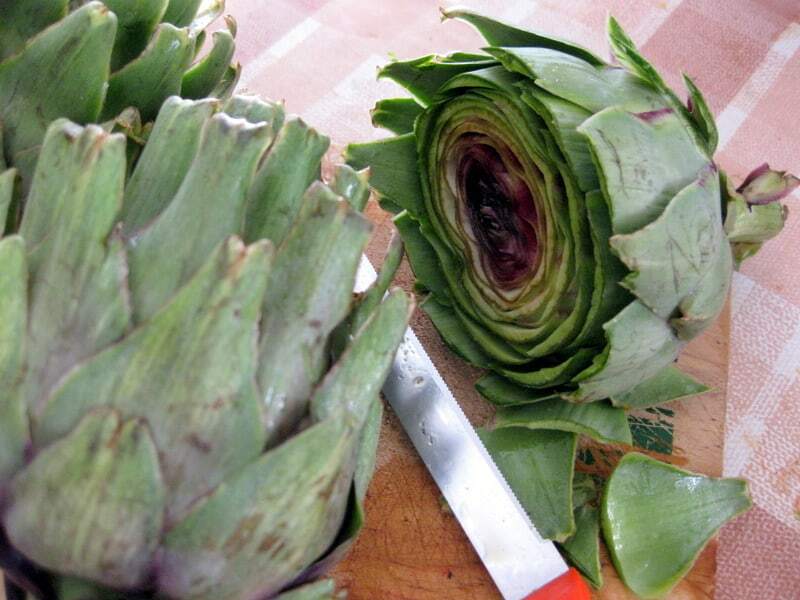 I ate my first artichoke at age 5 at someone else’s house. My brother added a lot of new vegetables and dishes to his eating repertoire that way. Of course, not all kids are like this. My daughter could care less what anyone else is eating–but my son will try almost anything that looks appealing to him (and if I am eating it and he doesn’t know what it is, he automatically wants to taste). My parents would always offer something once, and then just eat it in front of us and talk about how yummy it is. Also – if find that my kids do better with simpler things – one ingredient at a time – my kids will eat baked chicken breast and tomato slices anytime, but if you try to give them potato kugel, they can’t figure out what it is, and will balk at it. They also won’t eat tomato and cucumber salad, but they’ll eat tomato slices and cucumber spears. Another thing that helps is if I’m serving healthier/less liked things and less healthy/more liked things, I serve the healthier things first and keep the less healthy things in reserve. For example, if we’re serving salad and chicken, I know that my daughter won’t touch the veggies if the chicken is on the table, so I serve her veggies and let her eat some before I bring out the chicken. Thanks for responding to my question Hannah! Some of the things you and the other commenters suggest I have tried, but usually for only a day or two and then old habits come back. Of course, it helps if the kids are hungry and I find it hard to strike a balance between giving a snack when they come home from school and not turning the snack into an actual meal! Thanks for all the suggestions. These are definitely worth trying. I think I’ll post them as a list in my kitchen. tdr: My kids sometimes go snack-crazy. I make a really serious effort (don’t always succeed) to make snacks cucumbers, cherry tomatoes, carrot sticks, apple slices. If they end up not eating dinner, so be it. At least they haven’t eaten (much) trash. In terms of getting kids to tast new things, try to get the kids to take at least one bite of each food. When my kids were younger we made this a rule. The kids are also not allowed to declare they don’t like something they haven’t tried, and even if they don’t like it, they can’t carry on about it being yucky etc. Encourage them to again try things they have not liked in the past. Try adding familiar/well liked seasoning/sauces to unfamiliar or disliked foods. I have a child who has repeatedly rejected (after tasting) salmon, but when cut it into chunks, and glazed w/ bbq sauce and soy he liked it. If you see something new in the market, bring it home, show it to the kids and show them that you too are trying something new. . . turns out, my whole family loves Jerusalem artichokes, passion fruits, and kohlrabi. Above all, start young and get the kids involved in food prep early, they seem to be less averse to tasting things they help make. As for increasing the quantity of healthy food, start slipping it in where they won’t notice. Brown rice/whole wheat pasta when it’s going to be eaten with something saucy, but white when eaten plain etc. With the whole wheat pasta, I find the thinner pasta goes over better than the thicker, so I’ll by and serve the spagetti, but stay away from the penne etc. I like your suggestions. YOur idea of not buying the least healthy item reminds me of something. My friend just started weight watchers. They teach their members “never bring the enemy into your home.” I think that is sound health advice. My other advice is that kids will like healthy food their parents like healthy food.